Winter in St. George, UT, can range from fairly comfortable to surprisingly chilly and this winter is turning out to be one of the colder ones we’ve had in a while. In fact, since temperatures are dropping into the low thirties in the evening, Stonetree’s January 2019 St. George landscaping tips will be focused on how to protect your desert plants from the chill. While we don’t normally have snow in St George, it does happen occasionally. A few years ago, a surprise snowstorm killed many palm trees and cacti while severely damaging the survivor. But heavy frost can also damage your desert plantings, so you will need to take steps to protect them. With your palm trees, protecting their core is key, which means you will need to wrap the palm leaves in burlap to help keep frost from resting on the greenery. The trunk will be fine uncovered, though you may want to cover about a foot of the trunk leading down from the palm leaves. 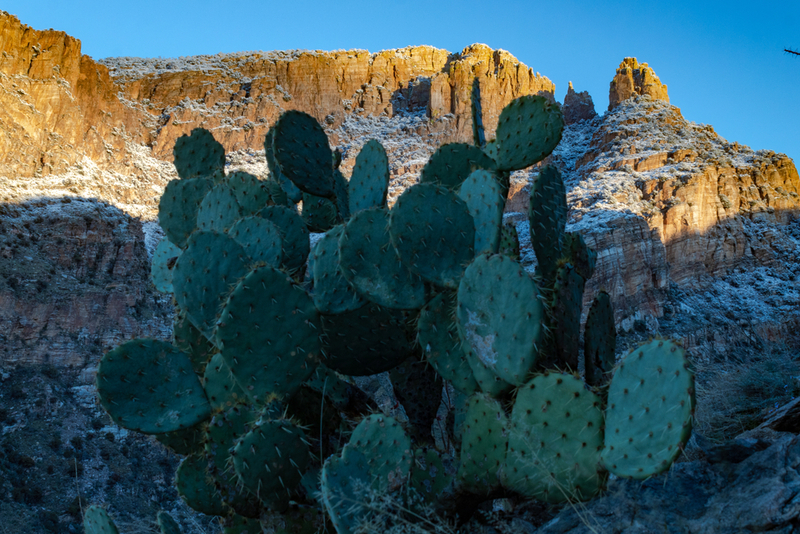 As for your cacti, a draping of burlap over them should be enough to keep hard frost from resting on them and freezing the tender skin. Some types of succulents like an aloe vera may be able to go without any protection, but if you are concerned, we recommend covering all your cacti and succulents with burlap. Even if you carefully removed all the leaves from your lawn, not everyone is so careful. So, you can end up with a batch of decaying leaves in your yard, which can promote fungal growth in your lawn. Also, harsh winter weather can lead to branches breaking and decorative plants dying, which also can contribute to a fungal incursion. If your lawn does become infected with fungus, the only thing to do is isolate the area infected, remove the affected area, and reseed or re-sod it, as fungus kills whatever part of the lawn it occurs in. So, to prevent needing to replant your lawn, check your landscaping for any debris which may have made their way into your yard. While you don’t need to water your landscaping right now, it is a good idea to check on your sprinklers throughout the winter months. If you haven’t winterized your sprinkler system, you may want to run them for a brief while to see if anything has been affected by the cold, such as cracked pipes or cold-warped sprinkler heads. If you have winterized your sprinkler system and don’t want to endanger it by running water through it, visually inspect the sprinkler heads to check if they are all upright and undamaged. If you need help with your landscaping, whether if it is with planting recommendations, or a landscaping overhaul, contact us. You can consult with our landscaping experts and develop the ideal design for your yard.